Believed to be Charles Paul Narcisse Moreau, a notable officer of the French army, a chevalier of the French Legion of Honor, and an internationally respected mathematician. He was invited to the 1903 Monte Carlo tournament and lost all 26 of his games. FSR: Poor guy. You'd think he could have scraped a draw somewhere. I remember Marshall included one of their games in his collection of best games. He didn't mention that the Colonel had gotten skunked. andrewjsacks: After this tournament, he might also have been Colonel Morose. alexmagnus: I know how he felt when playing there... Two years ago I, a 1600-rated guy, was invited after an open tournament to play some bitz tournament. What I didn't know: I'm one of only three (of 22) participants rated below 2000... I went 1/21, with the only win being on time in a lost position against a fellow sub-2000 (in the 17th round - after that win I got congratulations as if I just beat them all :D). One IM or FM, when playing with me, kind of teased me - "well, I just attacked your bishop, so what do you do?". But despite the horrible score I feel, retrospectively, that tournament was quite fun for me to play. andrewjsacks: I looked at several of his games. Colonel Moreau was obviously a capable player, but just out of his league here, and maybe in bad form, and no doubt distressed and strength-weakened after losing a number of games in a row to start... A pity for him he goes down in chess history like this. C'est la vie. FSR: <alexmagnus> At least your tournament just took a few hours. Moreau got to play and lose almost every day for a month. May-11-13 thomastonk: Due to some remarks in the Biographer Bistro I came here yesterday. After reading our biography, consisting of a date of birth and only two sentences, and comparing it with the sources, I am quite desperate. Our biography respects the situation in some sense by the formulation "Believed to be...". However, since Spinrad himself reports on some non-believers, I don't like this phrase. Moreover, the date of birth of the chessplayer is already that of the French officer. The French officer did also some mathematics, but in our biography he is "an internationally respected mathematician", which is in fact a quote from the first of Spinrad's articles. I know that Spinrad is an international respected mathematician is his field, but he did not prove that Moreau was, simply because all of the mathematical sources are French! Finally, the second sentence from our biography: "He was invited to the 1903 Monte Carlo tournament as a last-minute replacement for Mikhail Chigorin ...". This is simply wrong! Spinrad discussed this point and proved that Moreau's participation was planned already in 1902. Moreover, Spinrad writes: "Furthermore, other sources have named Wolf, not Moreau, as the substitute for Chigorin." 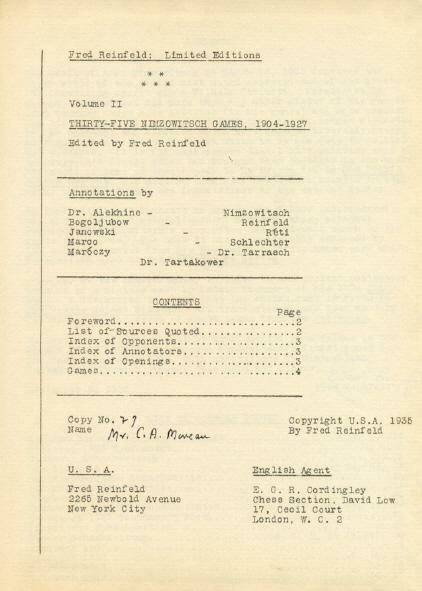 I can easily provide one such source: Emil Kemeny's tournament book, which appeared only a few months after the tournament as "The American Chess Weekly, Special Series No. 1" has a chapter on page 2 entitled "Tschigorin Not Permitted To Participate". There it is clearly stated with a lot of details that Wolf was admitted to play instead of Chigorin. Whoever is responsible for the current state of this biography should pay much more attention to the facts in the future! SteinitzLives: Colonel Moreau is a secret personal hero to many due to his ruthless refusal to withdraw from a tourney where he was not only out of his league, but in many ways a painfully growing embarrassment with each passing round, as he rather publicly hatched goose eggs like they were something more naturally expelled. I can but hope he took the losses with equal parts humor and stoic hardening of resolve. Clearly he never lost heart, and kept competing despite it all. How many of us know players that will withdraw from a tournament at the slightest prompting, citing lame reasons when so often it is just cowardice and the fear of enduring further humiliation that causes them to quit. To them I say: Look to Colonel Moreau and get back into that arena you lily-livered wimp! Consider the Colonel you sluggard, who harvested nothing in all seasons, yet continued to plow! May-12-13 thomastonk: For all who enjoy myths and rumors and speculation, I have some good news. Less is known about Colonel Moreau's time after the tournament, but maybe the following quote gives a useful hint: "Aus Paris. Das Caf� de la R�gence ist in andere H�nde �bergegangen und wird umgebaut. Inzwischen sind die Schachfreunde in die Taverne de l'Opera 26 �bergesiedelt. -- Der Cercle Philidor tagt jetzt im Caf� Moreau, rue St. Denis 133." Source: "Deutsche Schachzeitung", July 1903, page 227. No joke. <SteinitzLives> I know what you mean: the history is full of withdrawels of players who had bad results. But the meaning of bad results depends on the player's expectation. Colonel Moreau must have done something special to get the opportunity to play with such masters. Or does anybody think players like Tarrasch would have accepted him without a very good reason?! Moreover, he was no fool, he was a Colonel, and so he cannot have expected any other result than this. He was there in order to play and to lose for some personal reason, and I cannot detect the special property that makes him a "silent hero" as you described it. Described by Sherlock Holmes as "The second most dangerous man in London" [after Moriatry]. This name from literature reminds me of this player. May-12-13 thomastonk: <HeMateMe> Thanks for the keyword. It was Sherlock Holmes himself who played in Monte Carlo 1903 under the name Colonel Moreau, at least if you believe Irwin L. Stein and his article "The Case of the Curious Colonel" in BCM, June 1966, p. 169-171 (information taken from http://www.chesshistory.com/winter/...). Phony Benoni: Hmm. Charles Paul Moreau. Maybe they got him mixed up with Paul Charles Morphy. MissScarlett: I suspect it's stretching things to claim that the Colonel was an <internationally respected mathematician>. The journal references adduced by his Wikipedia entry strike one as rather provincial. zanzibar: <MissS> the "adduced" construct leaves me wondering who actually is doing the adducing. For the record, wiki never states that Moreau was a <internationally respected mathematician>, so they aren't doing the adducing. Your criticism must therefore be directly at the bio. Putting that aside, I wonder what prompted the qualifier <provincial>, that you used? Still, though not being journals that a mathematician at the level of a Legrendre, Laplace, Lagrange, or Louiville would use, I still don't see how these journals were exactly provincial. I'm not a historian of scientific journals of the 1800's, admittedly, but I did take a few moments to consider and research the issue. Not only was he not internationally respected, he wasn't nationally respected either. I suggest the only people who knew who he was were family and friends. How to resolve the A. in the C.A.? I hope you eventually learned how to play. Feb-10-17 Marcelo Bruno: How daring was he playing against all these memorable masters! Mar-11-18 Cibator: No-one writing about Col. Moreau seems to have mentioned that by the time he played in this tournament he was at least 65 years old - a notably more advanced age in those days than it would be regarded as now. Surely fatigue must have played a part in it all, especially towards the end? MissScarlett: Isn't that when fatigue usually sets in? FSR: <TheFocus> He didn't go 0-36, just 0-26. How to resolve the A. in the C.A.? . . .
ChArles PAul NArcisse MoreAu. Do I have to explain everything?